In an arranged marriage of optics and mechanics, physicists have created microscopic structural beams that have a variety of powerful uses when light strikes them. Able to operate in ordinary, room-temperature environments, yet exploiting some of the deepest principles of quantum physics, these optomechanical systems can act as inherently accurate thermometers, or conversely, as a type of optical shield that diverts heat. The research was performed by a team led by the Joint Quantum Institute (JQI), a research collaboration of the National Institute of Standards and Technology (NIST) and the University of Maryland. Described in a pair of new papers in Science and Physical Review Letters, the potential applications include chip-based temperature sensors for electronics and biology that would never need to be adjusted since they rely on fundamental constants of nature; tiny refrigerators that can cool state-of-the-art microscope components for higher-quality images; and improved "metamaterials" that could allow researchers to manipulate light and sound in new ways. Made of silicon nitride, a widely used material in the electronics and photonics industries, the beams are about 20 microns (20 millionths of a meter) in length. They are transparent, with a row of holes drilled through them to enhance their optical and mechanical properties. "You can send light down this beam because it's a transparent material. You can also send sound waves down the beam," explained Tom Purdy, a NIST physicist who is an author on both papers. The researchers believe the beams could lead to better thermometers, which are now ubiquitous in our devices, including cell phones. "Essentially we're carrying a bunch of thermometers around with us all the time," said JQI Fellow Jake Taylor, senior author of the new papers. "Some provide temperature readings, and others let you know if your chip is too hot or your battery is too cold. Thermometers also play a crucial role in transportation systems—airplanes, cars—and tell you if your engine oil is overheating." But the problem is that these thermometers are not accurate off the shelf. They need to be calibrated, or adjusted, to some standard. The design of the silicon nitride beam avoids this situation by relying on fundamental physics. To use the beam as a thermometer, researchers must be able to measure the tiniest possible vibrations in the beam. The amount that the beam vibrates is proportional to the temperature of its surroundings. The vibrations can come from two kinds of sources. The first are ordinary "thermal" sources such as gas molecules buffeting the beam or sound waves passing through it. The second source of vibration comes purely from the world of quantum mechanics, the theory that governs behavior of matter at the atomic scale. The quantum behavior occurs when the researchers send particles of light, or photons, down the beam. Struck by light, the mechanical beam reflects the photons, and recoils in the process, creating small vibrations in the beam. Sometimes these quantum-based effects are described using the Heisenberg uncertainty relationship—the photon bounce leads to information about the beam's position, but because it imparts vibrations to the beam, it adds uncertainty to the beam's velocity. "The quantum mechanical fluctuations give us a reference point because essentially, you can't make the system move less than that," Taylor said. By plugging in values of Boltzmann's constant and Planck's constant, the researchers can calculate the temperature. And given that reference point, when the researchers measure more motion in the beam, such as from thermal sources, they can accurately extrapolate the temperature of the environment. However, the quantum fluctuations are a million times fainter than the thermal vibrations; detecting them is like hearing a pin drop in the middle of a shower. In their experiments, the researchers used a state-of-the-art silicon nitride beam built by Karen Grutter and Kartik Srinivasan at NIST's Center for Nanoscale Science and Technology. By shining high-quality photons at the beam and analyzing photons emitted from the beam shortly thereafter, "we see a little bit of the quantum vibrational motion picked up in the output of light," Purdy explained. 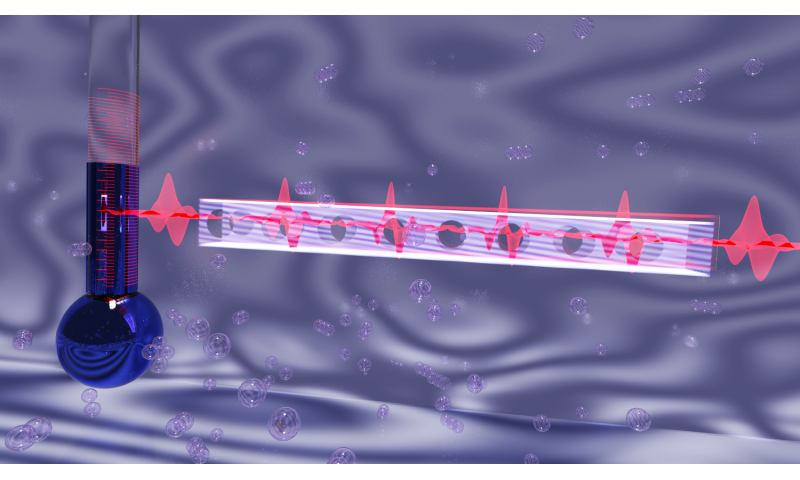 Their measurement approach is sensitive enough to see these quantum effects all the way up to room temperature for the first time, and is published in this week's issue of Science. Although the experimental thermometers are in a proof-of-concept phase, the researchers envision they could be particularly valuable in electronic devices, as on-chip thermometers that never need calibration, and in biology. "Biological processes, in general, are very sensitive to temperature, as anyone who has a sick child knows. The difference between 37 and 39 degrees Celsius is pretty large," Taylor said. He foresees applications in biotechnology, when you want to measure temperature changes in "as small an amount of product as possible," he said. The researchers go in the opposite direction in a second proposed application for the beams, described in a theoretical paper published in Physical Review Letters. Instead of letting heat hit the beam and allow it to serve as a temperature probe, the researchers propose using the beam to divert the heat from, for example, a sensitive part of an electromechanical device. In their proposed setup, the researchers enclose the beam in a cavity, a pair of mirrors that bounce light back and forth. They use light to control the vibrations of the beam so that the beam cannot re-radiate incoming heat in its usual direction, towards a colder object. For this application, Taylor likens the behavior of the beam to a tuning fork. When you hold a tuning fork and strike it, it radiates pure sound tones instead of allowing that motion to turn into heat, which travels down the fork and into your hand. "A tuning fork rings for a long time, even in air," he said. The two prongs of the fork vibrate in opposite directions, he explained, and cancel out a way for energy to leave the bottom of the fork through your hand. The researchers even imagine using an optically controlled silicon nitride beam as the tip of an atomic force microscope (AFM), which detects forces on surfaces to build up atom-scale images. An optically controlled AFM tip would stay cool—and perform better. "You're removing thermal motion, which makes it easier to see signals," Taylor explained. This technique also could be put to use to make better metamaterials, complex composite objects that manipulate light or sound in new ways and could be used to make better lenses or even so-called "invisibility cloaks" that cause certain wavelengths of light to pass through an object rather than bouncing from it. "Metamaterials are our answer to, 'How do we make materials that capture the best properties for light and sound, or for heat and motion?'" Taylor said. "It's a technique that has been widely used in engineering, but combining the light and sound together remains still a bit open on how far we can go with it, and this provides a new tool for exploring that space."